First Line: The place was a beach town near LA; the event was lunch at La Casita, a Mexican restaurant Harry and Kate went to from time to time. Kate Waters has come to Dudley, Arizona, in the remote southeastern corner of the state, to escape an abusive relationship. Phoenix police officer Malcolm MacGregor has come there to heal after the death of his wife. The only thing anyone knows about Carrie and Wes Cooper is that they were shot dead right there in town. Since Dudley relies a great deal on tourism, those running the town want a quick arrest, but after having spoken to Carrie briefly, Kate is convinced that the wrong man is sitting in jail. She and MacGregor find themselves working as a team to search through the victims' history in order to catch a killer. Having read and enjoyed all of Thornton's Chloe Newcombe mysteries which are also set in Dudley (a thinly disguised Bisbee), I was excited to see this first book in a new series. As I've come to expect from Thornton, the setting is vivid and adds so much texture to the story. In addition, the mystery kept me guessing from beginning to end. However, all the various parts of the book never really gelled into an enjoyable read for me. Thornton inserts derogatory comments about Arizona SB1070 (the highly inflammatory immigration law) and the state's (lack of) gun control. I happen to agree with her on both counts, but if she feels that way about guns, why does one come in so handy in one particular scene? It certainly could have been written differently. Although the book is listed as a "Kate Waters" mystery, Kate does very little investigating in the book. Instead it's MacGregor's expertise that is put to good use. I liked MacGregor even though he seems to be one of those men who are drawn to damsels in distress. He's a good investigator and a nice guy. Kate Waters is certainly a damsel in distress. A very annoying one. I have to admit that she is the main drawback in this book. The woman has just escaped from an abusive relationship. She lives in fear that her ex will find her. She is extremely paranoid. All that being said, then why on earth did she go do something and leave her house unlocked for the entire day because she knows a friend will be stopping by? That almost beggars belief. And-- once again-- if Kate is so paranoid, why can she never remember to charge her cell phone? A bit difficult to call for help if her phone's dead, isn't it? 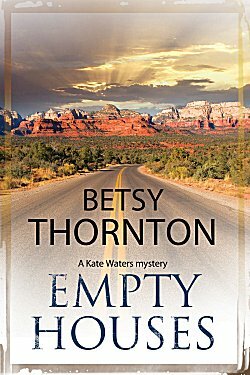 I did enjoy the mystery in Empty Houses, and as always, I can't get enough of the setting, but with Kate Waters as the main character, I doubt very much that I'll continue with this series. What a shame. Oh, Cathy, I don't like the damsel-in-distress type character either! That alone would make me wonder about the book, although the setting did get my attention. I'll probably wait on this one, but it's good to know about this series.